Stripes may look good on your cat, but don’t get the striations from Mephitis mephitis mixed up with your pet. You might end up with an acrid stench you won’t be able to easily get rid of. About the same size as the average pet cat, striped skunks have a small head and short legs. But that’s where their similarities to fuzzy felines end. As the name states, two white lines form a “V” from a skunk’s shoulders all the way to the end of its tail, creating their distinct stripe pattern. Both male and female look alike, with the male being roughly 10% larger than females. According to the Smithsonian National Zoo, the weight of striped skunks can vary greatly depending on the time of the year. The average weight can fluctuate between 1.5 and 13 pounds, especially during winter. That’s because skunks do not hibernate during the winter. They can also lose up to 50% of their weight during winter months, as these mammals rely on their fat reserves in colder temperatures. During the fall, they will store body fat and sleep in burrows for several weeks at a time as the weather gets colder. They will usually live in burrows made by other animals. In late February through March, skunks will start to mate. With a short gestation period (roughly 60-75 days), baby skunks – known as kits – can be born anywhere from mid-May to early June. In Ohio, striped skunks occupy rural areas and can even be spotted in suburbs. They are quite adaptable animals. Just like humans, the skunk is an omnivore; they eat both plants and animals. Even though they have an infamous reputation, skunks play an important role in our ecosystem. They help with controlling populations of insects and mice that destroy crops and plants, which are beneficial to farmers, landowners and gardeners. 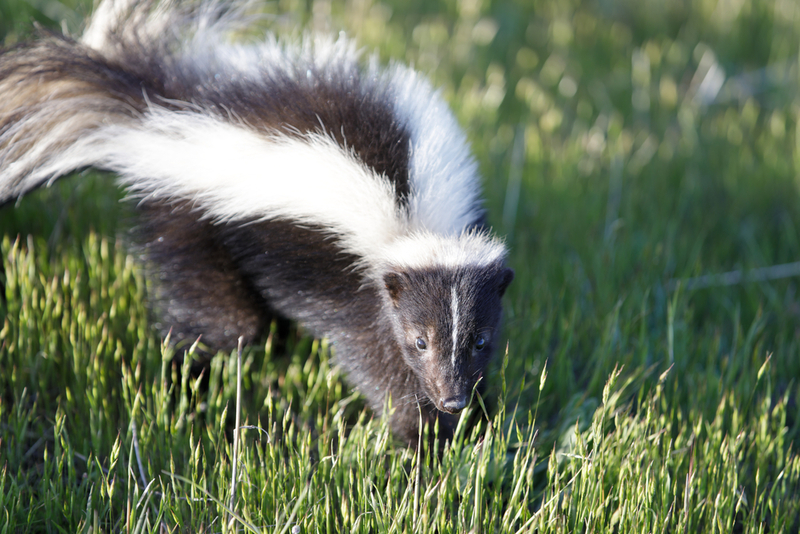 While striped skunks may have an unpleasant stench get a bad rap, their opportunistic feeding habits mean they’re an important source for insect control. Be sure to thank a skunk the next time there are no beetles or other pests making your home their new home.